I used Excel every day until I retired from my company in 2009. The Excel was running on Windows XP. After that I didn't use Excel for a while. I bought a new PC on which Excel was installed, and the PC was running on Windows 7. I tried to use the Excel many times, however it was verry difficult to use new Excel because the functionality was very different from the old Excel. So I gave up on using Excel. Two months ago, I bought a new Android Tablet on which Excel was installed so I tried to use Excel again. However Android Excel is more difficult to operate due to no mouse. There is no way for me to use Excel. 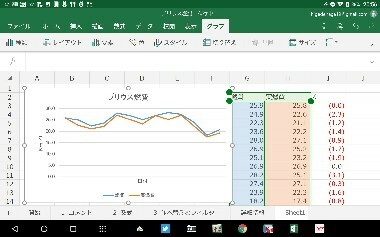 The picture is the worksheet of Android Excel. I agree the words someone said. In a timely mannar "Use It or Lose It" was the title which was broadcasted on NHK Ken's Enjoy English Conversation on Apr 9th. English conversation is also same thing for me as I haven't spoken English for long time. However just for English, I don't want to give up.